You gotta hand it to em, the MBC guys pulled out all of the stops to put on an absolute mega Minibike World Championships Protected by Bell Helmets at the weekend and even hired in the weather which kept shining down on everyone for the full four days! 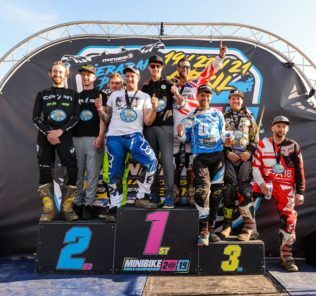 No one can say they do things by halves, as every conceivable angle was covered to make the Minibike World Champs a credit to the UK and everyone who rode, supported and worked with the MBC crew pulled off a stormer. One thing you can’t plan for is the event atmosphere and even though this was a highly competitive meeting the family feel and friendliness around the Paddock meant that those who traveled from overseas went home feeling welcomed and wanting to come back for more. On track a stacked field of racers from 13 different countries lined up looking to take home the World crown, and the superbly prepped Fatcats Motoparc near Doncaster was the perfect stage for the racers to show off their art! The depth of talent in the Pro 160cc class was mouthwatering, with the finest array of Minibike talent from around the globe looking to battle it out to be named as the best Minibike Racer on the planet. It was the Frenchman Mike Valade who fired a warning shot in Qualifying with some electrifying lap times, and it was Valade who was to continue this speed into the racing as he took 4 races from the 5 and the overall title. Valade’s only defeat came at the hands of super Brit Bradley Pocock who showed his fitness and determination to claw his way onto the Frenchman’s back wheel and take the lead and the win in the 4th race, and also becoming the top UK racer with 2nd overall. The best was left to last for 3 times Minibike Champs winner Dutchman Frank Van Homoet as he found his mojo in the final race of the day and a second place which gave him the 3rd spot on the podium, edging out American racer Justin Sipes who finished 4th. Sipes, who hasn’t ridden a minibike for 2 years, impressed everyone with his super technical riding skills and won many an admirer for his smooth and ultra fast style. The 2nd ranking Brit was Dirt Hub’s feature racer Blaine Blackwell who gave everyone the airtime they were looking forward to, on his way to a highly credible 5th place. Kris Ayres has been off the radar this season due to injury but a majestic 6th overall will go down well within his camp and show’s he is a MBC contender for 2018. Stepping up some cc’s Ash Gorman deserves huge credit for coming home in 7th overall. Such was the demand for places that the MBC 160’s had a support class of some 40 racers and in this full on class it was Pryce Howard who grabbed the win by a solitary point ahead of the consistent Simon Gummer. The Third place finisher Sean Mason was just one point ahead of 4th place Craig Sharp. Daniel Lee was to rue his 4th race where he scored no points, as although he won 3 races it meant he finished down in 5th place, with Leon Adams in 6th and claiming the last awesome Minibike World Champs number board award, which were awarded to the top 6 in each Adult class. By far the most dramatic class of the weekend was the Masters. Normally known as the stylish group with years of experience under their belts, this facet of their racing armoury seemed to go out of the window as the lure of World Champs glory seemed to ignite a youthful spark, and with it a tendency to crash, and crash hard. The drama started in the Masters straight away as the first lap was crash city right the way through the field with the race later being red flagged due to another incident. 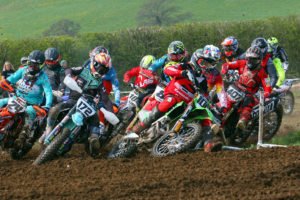 The crashing epidemic continued into race two where leader Leon Thomas, who was comfortably in front, got a slide on and went down heavy, knocking himself unconscious and out of the title race at the same time. It was the turn of Simon Vowles in the final race to sample the inside of the ambulance, rounding out the Masters weekend which was more like an episode of Casualty. Steering clear of this trouble was Pat Crump who won all of his races on day 1 on his way to claiming the World title. Battling bravely on, after his race one travails was Dale Howard to come 2nd overall with Portuguese racer Marcio Ferreira in third. Jason Gardner put in an impressive performance for 4th overall with John Sanders 5th and Simon Vowles still managing 6th and the final number board. The Vets class was won in impressive style by the smooth and steady Christopher Rose who in amongst the Masters carnage rode cleverly to take all five race wins and the World title. There was a popular runner up in this class in 63 year old Colin Blackwell who rode well and consistently all weekend long. Darren Griffiths came third despite crashing out in his final ride and breaking his Scapula, with Jason Gutteridge in 4th, Russel Mason 5th and Elvis Jenner in 6th. The competitive 110cc class was as always action packed with a host of injuries along the way. Matthew Lofthouse suffered a leg injury as did Pablo Becerra, whilst Oscar Stearn headed Hospital side with an injured wrist. We wish all of the injured racers a speedy recovery…. Now back to the action where Nathan Marsden showed his talent for getting the most out of his 110 machine and rode clever and calculated all weekend to win the title by just one point ahead of Mathew Pocock who was constantly biting at Marsden’s ankles throughout the meeting. Craig Rose put in a consistent performance for 3rd overall with Piers Skinner in 4th. Elliot Gardner rode well to gain 5th spot ahead of Lloyd Pettett in 6th. A special mention must go to Jeremy Mcknight who traveled all of the way from New Zealand to race and came away with 8th overall and a stack of new friends. Onto the Youth classes where the Top 10 all received prizes. The MBC battle between Louis Dutton and Ewan Goddard was reenacted in the Youth 125cc Senior class with it being Dutton, who despite bike issues and having to borrow a machine from his younger brother Alex taking the title with 4 wins. Goddard took the chequered flag in the 4th race on his way to second overall with young Spanish rider Daniel Agea Moreno in 3rd. Portuguese racer Ruben Rodrigues made his trip worthwhile with 4th, ahead of Jame Lee in 5th and Sam Thompson in 6th. The 7th place finisher was Alex Cook just one point ahead of Red Circles racer Teagan Parnell, with Thomas Spooner 9th and French racer Proenca Guilherme in 10th. It was tough going for the youth racers but in the Youth 125cc Junior class Senna Ace Summers made light work of the conditions on his way to the World title. That’s not to say it was easy, as a race 2 crash saw him finish down the order and the flying Harry Streeter gaining the win, meaning the title went down to the last race where Summers edged out his compatriot Streeter for the top podium place. Leo Vowles strung together a host of top 3 finishes to come home with the overall 3rd and still completed his final race whilst his Dad was on the way to Hospital. We are sure Simon would of been proud of his son for claiming a Rostrum place in the World Champs though. Freddy Hills enjoyed the experience and took 4th overall with Jake Speller in 5th and Jack Perry 6th. Mickey Bennett rode well for 7th whilst Alex Dutton had to settle with 8th due to injuring himself on the Saturday but full credit must go to him for riding well on a 110 after letting his brother borrow his machine. Last but by no means least the little rippers in the Auto 50cc class who showed true fighting spirit to race on a tough track for their little wheels. Winner Jamie Keith stole the show with some awesome riding all weekend long and a maximum 5 wins from 5. Little Zane Stephens enjoyed his trip up North with a second place finish overall with Harley Smith in third. Harlow Green got better as the weekend went on taking second places in his final two rides for 4th overall, with Harry Lee in 5th and Finley Pickering in 6th. Jaxon Haswell was in amongst it for 7th ahead of Max Pridmore in 8th and the youngest racer of the whole competition Riley-Ray Barrow putting in a tremendous performance for 9th overall followed by Rhys Whyment in 10th. Well what can we say…. this is one event that’s going to take a lot of beating and massive credit for everyone involved for making it such a special weekend. Roll on 2018.